Meet the right knee scooter in Denver if you’re concerned about the rental cost. The Roscoe Deluxe is one of the least expensive options, with some comfort features. It’s a great scooter for rolling around inside an office space or around the home. 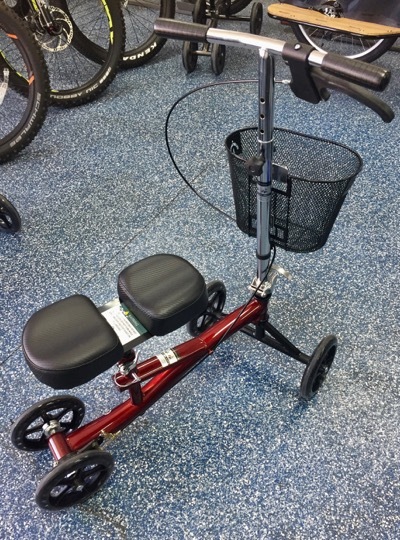 Get your affordable knee scooter rental today! If you’re wearing a boot with a pump placed directly on the front, this can be a problem with most knee scooters. The Roscoe Deluxe provides the ideal option, with a convenient space in the seat which gives you the more a more comfortable ride. This small knee scooter has one of the most abundant baskets available, providing optimum convenience if you have books, a computer, or paperwork you need to carry around the office or your home. Many low-cost knee scooters have cheaply-made-brakes. Many use a crummy, one wheel brake. The Roscoe Deluxe is an affordable option with a brake system that activates both wheels, making for a much more secure situation. Call us today and order your affordable knee scooter in Denver today.